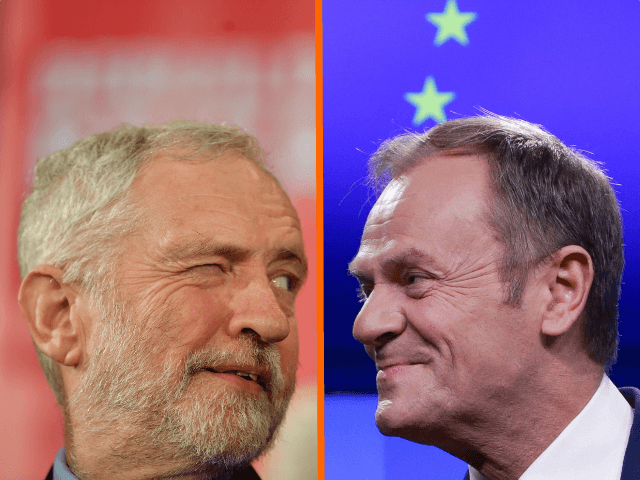 EU bureaucrats have backed plans by opposition leader Jeremy Corbyn that would keep the UK closely aligned to the EU, after refusing to reopen negotiations on the Withdrawal Agreement with Prime Minister Theresa May. President of the European Council Donald Tusk told Mrs May on Thursday that the Labour leader’s plans were a “promising way out” of the Brexit deadlock after MPs have refused to back the prime minister’s deal, according to Sky News. This week, Corbyn wrote to the prime minister with five demands to soften Mrs May’s already-soft boiled exit plans in exchange for support from the Labour Party in the House of Commons. The plans include a “permanent and comprehensive UK-wide Customs Union”; close alignment with the Single Market; guaranteeing that rules on workers’ rights stay close to those set by Brussels; “clear commitments” on participation in EU programmes and agencies, particularly on environmental, industrial, and education matters; and committing to future security arrangements, including the European Arrest Warrant — all of which would hinder the UK’s future trading with the rest of the world and the country’s independence. “The PM continues to believe that an independent trade policy is one of the key advantages of Brexit. Her position on the customs union hasn’t changed,” they added. “There is no question to remove the backstop because that is absolutely necessary for securing and safeguarding the Good Friday Agreement, safeguarding the internal market and safeguarding also the peace process,” he added. The Irish backstop is the most contentious part of the Withdrawal Agreement not just for Brexiteers but the Northern Irish conservatives the Democratic Unionist Party (DUP) as well, on whose support the Conservatives are dependent to maintain their minority Government. The backstop will come into effect if no free trade agreement is agreed by the UK and the EU by December 2020 (the end of the transition period), locking Northern Ireland into regulatory alignment with the EU. This would effectively create a customs border down the Irish Sea with Northern Ireland treating Great Britain as a third country in terms of trade and therefore threatening the integrity of the United Kingdom. Brexit Secretary Stephen Barclay will head to Strasbourg, France, on Monday to discuss “alternative arrangements” to the backstop with the EU’s Chief Brexit Negotiator Michel Barnier, while the prime minister is set to meet with Irish Taoiseach Leo Varadkar in Dublin.